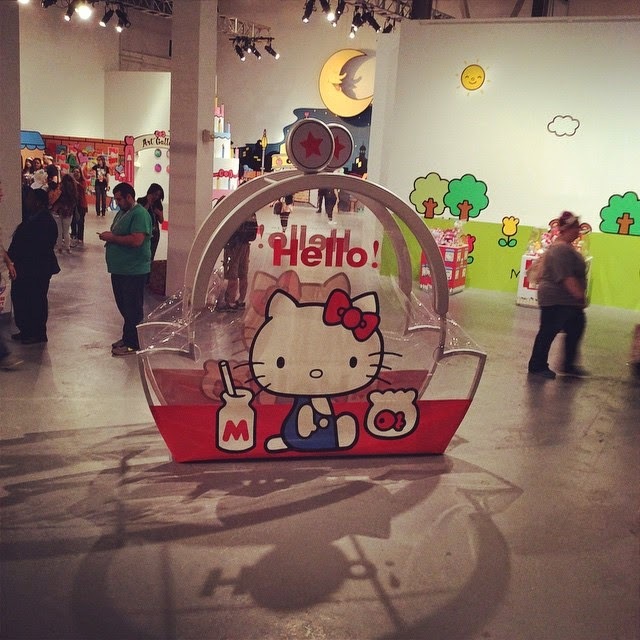 Located in Little Tokyo of Los Angeles, the Hello Kitty Convention started off with so much excitement and joy. The evidence was seen on the first day of the four day event. I had arrived at six in the morning, but did not start lining up until seven. I did not know if people would be lining up hours early, but I wasn't going to take a chance and had planned my day accordingly. It was a good decision made on my part because the line had started to grow long by 8:30 in the morning. Immediately, you could see a lot of people had come dressed up in kittified or cosplay outfits. It was the fun part of attending a convention. 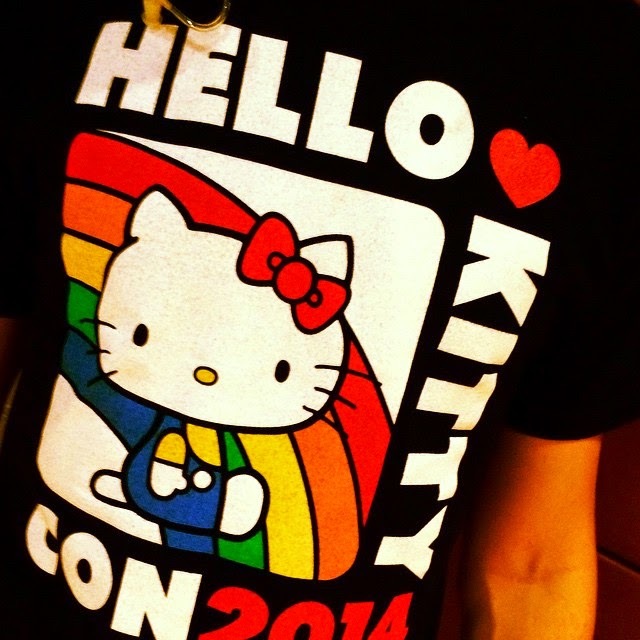 Even if someone didn't dress up and wanted to make the day more special, then they could just buy a Hello Kitty Con shirt. Going to conventions like these are all about creating fond memories to last a lifetime. 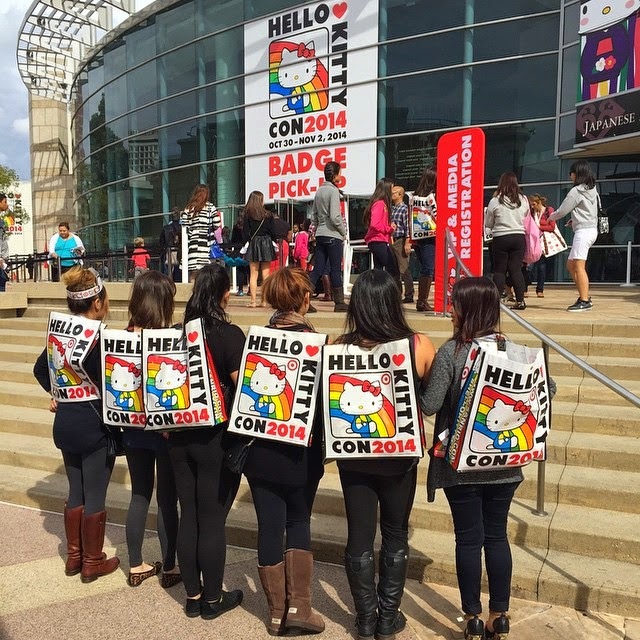 They made us wait a little longer before letting us enter the convention. A lot of people made a mad dash into the building. While I was passing by a security guy dressed in a black suit-- standing in the middle of crowds of fans trying to make their way into the convention-- I thought about how he must be feeling at the moment. What was he thinking when he saw tons of Hello Kitty lovers coming at a "very very fast-paced" (we were forbidden to run) speed towards him. We must look like crazy hyper zombies coming at him full speed on the hunt for Hello Kitty. 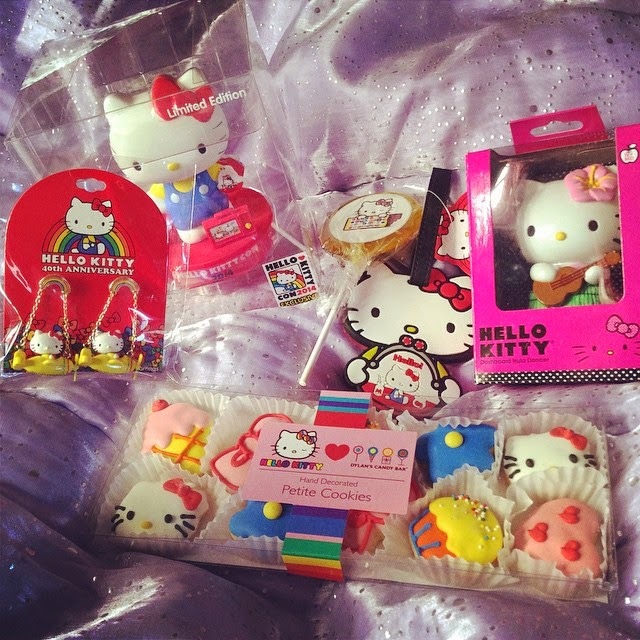 Not the kitty itself, but all the special exclusive items that was promised and enticed for the last few months. For the last month, Sanrio teased their fans with so much oomph that it was amazing that we didn't trample the Staff Convention people who got in our way. I am not kidding. I am very serious. For those who are not fans of Hello Kitty, beware of us on that day. We may look cute, but we can be scary at what we want. 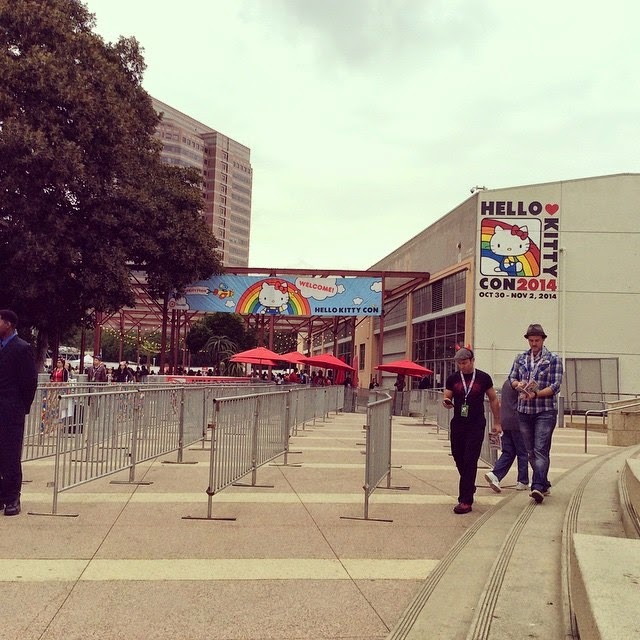 The good thing is that Sanrio didn't bring out Hello Kitty, the mascot, to stand in front of the entrance or else, the Convention security team would have had to fight off fans from freaking out over Hello Kitty. Hey, ya never know... yes, there is a human inside the mascot costume, but on that special day-- all bets are off. Obsession takes over. On that first day, I went straight for the Vintage Shoppe. I was torn between the retail store and Vintage Shoppe, but I knew vintage was more important to me. From what I read about the Vintage Shoppe, I was expecting retro replicas of the vintage items sold in the 70's and 80's. I did not know that they were actually selling the real vintage stuff like really old school 1976 plushes and stationery. I was impressed and my greedy eyes couldn't stop from staring at all the good stuff. I have never seen so many vintage items all in one place and in person. It was amazing. Truly amazing! As a vintage collector, you live for this chance to see it live when you've only seen pictures of what vintage pieces look like. 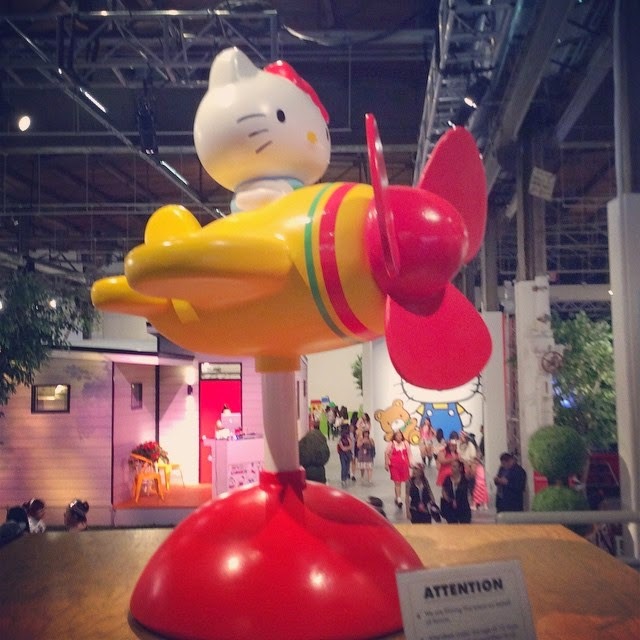 Reality hits you that you could be part of that amazing Sanrio history by owning one of these vintage items. As for myself, I wished that I could buy one of their medium sized Hello Kitty plush in the yellow overall jumpsuit, but I was on a budget. I wasn't able to save enough to buy everything that I wanted. I blame Sanrio Japan for that one. Seriously, too much temptation because I had to buy the newer stuff that is released every Tuesday PST time. 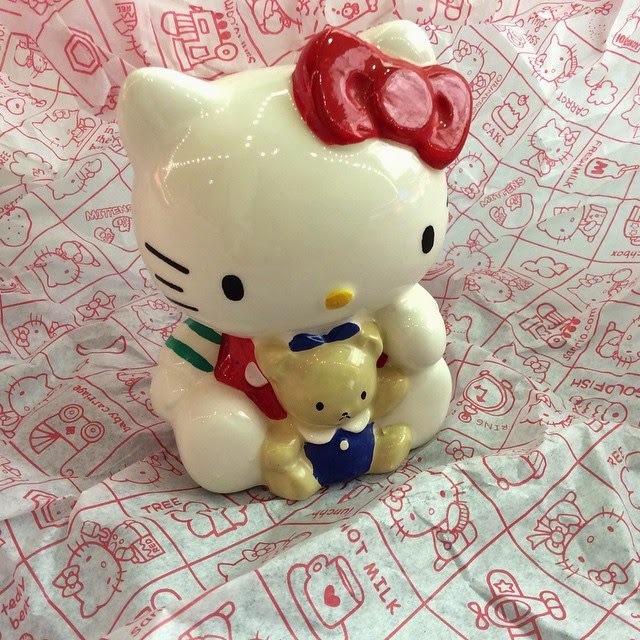 Even though, I did cut back on spending for this convention-- I did buy this gorgeous coin bank below. My brother kept telling me that everything in the Vintage Shoppe was overpriced, but he and many million others won't EVER understand what vintage means to us, collectors. I could have chosen a plush doll that would have totaled over $100 USD, but this particular coin bank was more important for me to get my grubby hands on. Once it was paid and in my hands, I felt like I was walking in clouds. Fluffy white clouds swirling around me and disappearing off to the distance as I exited the shop. I was in heaven. I was beyond thrilled with my purchase for the day. I felt like I scored a major wanted item off my wishlist. Logan just rolled his eyes at me because I couldn't stop smiling. 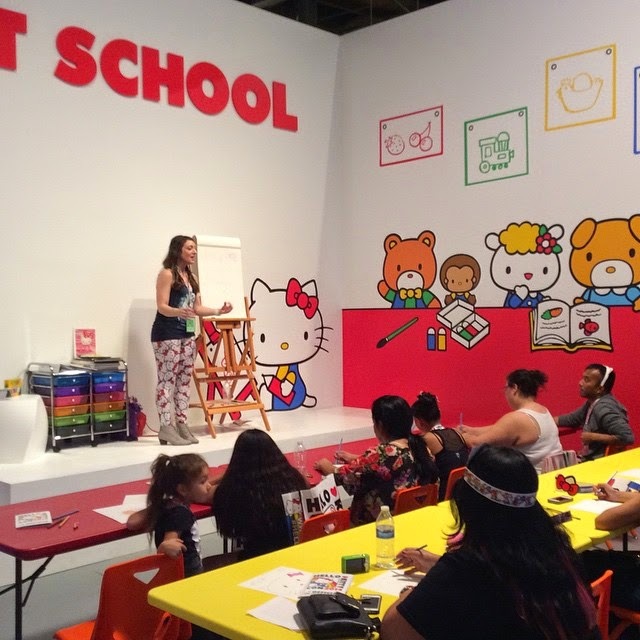 The rest of my first day went by quickly with a stop by the food courtyard and one of the first panels: "Inspired by Her- Artists and Hello Kitty." 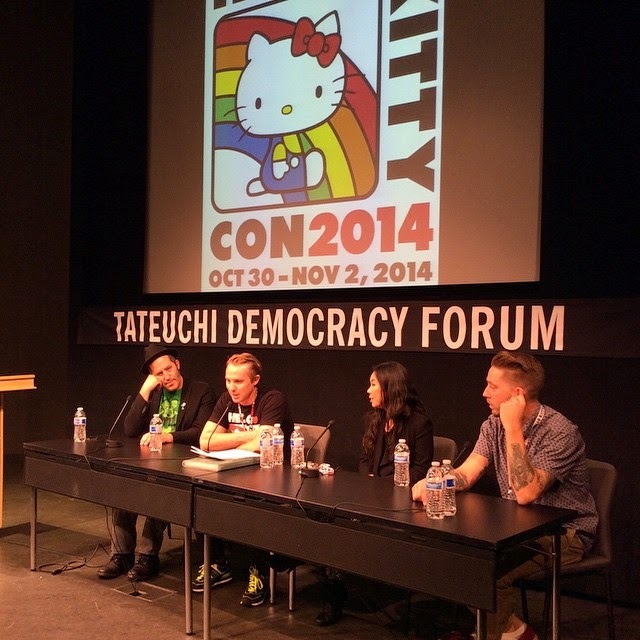 The panel discussion spotlighted three talented artists: Paul Frank, Aiko, and Jordan Nickel aka POSE. If anyone is interested, I have a 15 minute footage of that discussion that will later be posted on Youtube sometime this week. I had missed out on the Guys collector panel at 3pm and wished there was a way to see a clip of it. Another panel that I got to see was on a Friday-- the Super Fans Unite. The panel discussion took place with 4 all-female collectors: Maria Fleischman, Salumeh Eslamieh, Ariel Elizabeth, and Tera Patrick. Since there was a cameraman in the room with us, I didn't think to record the panel discussion. I regretted it because the very nice cameraman told me that they were recording for a long documentary project that has been going on for four years now. Then, he proceeded to let me know who I can ask about if a video will be posted online for the other unseen panels. From the few people that I spoke with, I came away disappointed with what I learned. These interesting panels might never see the light of day. I regretted not attending all the panels. I had left early on Thursday afternoon because Logan wanted to leave. We couldn't buy anything more until that Friday. Friday came smiling down upon us. Logan went off to buy what he wanted to get and I went straight for the retail store upstairs. Compared to the lucky ones coming out of the Convention with 3 to 5 shopping bags, I was still happy with the items that I have chosen to purchase. I wanted to buy more stuff, but I held myself back and didn't do too much damage to my wallet. Sigh. My wallet is safe, y'all. There is one small ittty-bitty thing that I have to mention: the 2014 exclusive Convention Bobblehead. When I first saw it in person, I had to really think hard and long whether I should buy it or not. I wanted to leave the Convention with a good 2014 Souvenir to represent this awesome event for years to come. I chose this Bobblehead over the HK FigurIne holding a red bow in front of her face. What made me had second thoughts about purchasing this Bobblehead was the fact that it looked too "plasticky" and cheap for the expensive price of $32. Compared to the Three Apples 2009 Bobblehead, this looked cheaply made. Unfortunately, I bought this with sentimental value instead of really loving it. It sure won't be my favorite HK Con Bobblehead for future other Convention bobbleheads to add to my collection. 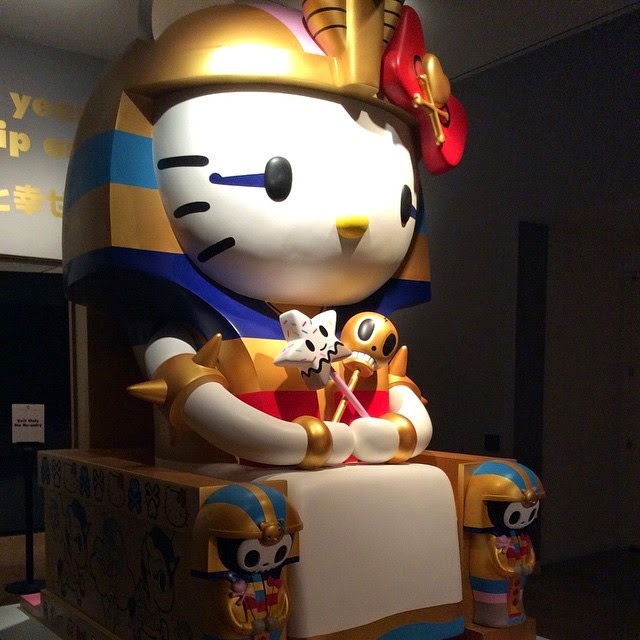 Out of all the event, the most highlighted part was the Hello Kitty Art exhibit at the Japanese American National Museum (JANM). Without this amazing and talented show of Art exhibit, the Convention wouldn't have been as great as it is this year. It's a must-see creative art exhibit that is well put together. 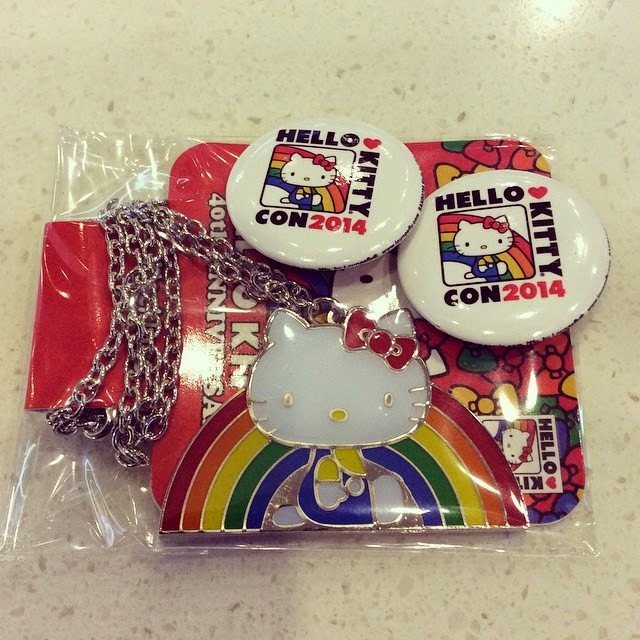 After my two fun-filled days at Hello Kitty Con, I knew that I want to attend another Hello Kitty Convention again. 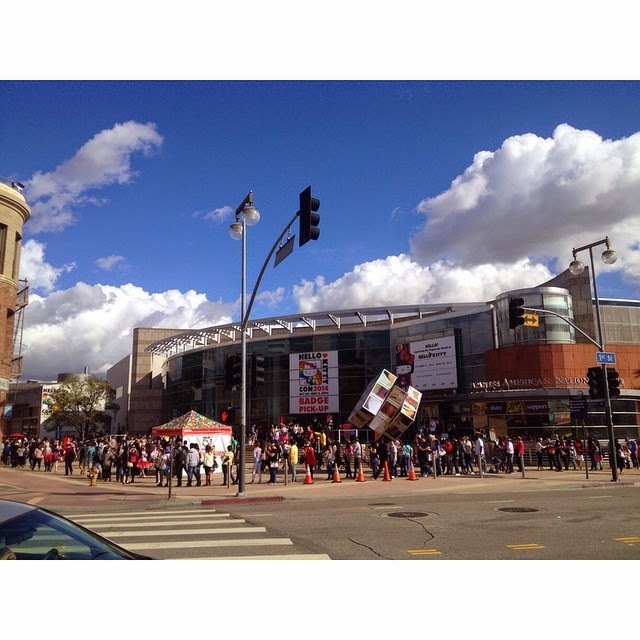 Even with the long lines, it'll be worth it. This time, I plan to attend all four days because two days seem to be not enough time to do what I wanted to do with the long lines taking most of my time. Sanrio, haven't you heard of VIP lines with no waiting? Please please have that for your next planned Convention and sign me up for all the VIP lines. I may have tremendous amount of patience, but my feet are still bruised and hurting from all that standing. Despite all that, I'm ready for the next HK Con. Are you?